When I first heard about the site Clipix.com I wasn't sure if it was a website I would enjoy. I wondered if it would take a long time to clip a picture to post on my clipboards or would there be a difficult time to get my content to even show up on my clipboards? I was pleasantly surprised just how easy it is to use clipix! You sign up which takes all of a minute or two, then it tells you in the beginning how to add your clip button to your tool bar, and there is no downloading! How cool is that!?! I had so much fun clipping pictures that I really am looking forward to pressing my clip button every time I see something I want to remember and go back to. I usually bookmark pages but then forget why I did so then I end up deleting my bookmarks, but with Clipix you are clipping the photo and a short description so you'll know exactly why you are clipping the photo or content. I have added a Clipix.com button on my blog so you can easily find the site because I know you will enjoy using the clipboards. I chose to do nails & nail polish, recipes, general and great shoes for my clipboards. I will eventually add more boards as I go along. 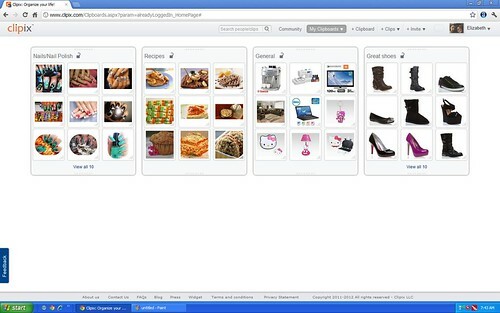 If you open a Clipix.com account feel free to leave me a comment to tell me just how much you enjoy using the clipboards, why you're using Clipix and if you'd like to be friends on clipix, that way we can use the Syncboards! In the Syncboards we can all clip items that we all can see in real time. And now you can use Clipix on your iPhone using the Clipix app. This post has been compensated by SocialSpark.com. All opinions are mine and are not influenced by any compensation.